Multiyear pistachio deficit irrigation research (Goldhamer and Beede, 2004) (Goldhamer, 2005) shows that significant irrigation water (approximately 10 inches during the season) can be saved by strategically irrigating pistachios. Critical periods when pistachio should NOT be under-irrigated are: (1) from nut filling to hull slip (Stage 3: July 1 to Sept. 15 in the San Joaquin Valley), and (2) from bloom to end of shell expansion (Stage 1: Apr. 1 to May 15 in the San Joaquin Valley). Deficit irrigation of pistachio CAN be practiced during the following periods: (1) 50% reduction in irrigation during shell hardening (Stage 2: May 16 - June 30 in the San Joaquin Valley), and (2) 70 - 75% reduction in irrigation during the postharvest period (Oct. 1 - Nov. 15 in the San Joaquin Valley). San Joaquin Valley pistachio water use for normal and proposed Regulated Deficit Irrigation (RDI) regimes. Irrigation schedule early in the season must take into account stored winter rainfall. Goldhamer, D.A., Beede, R., Moore, J.M., Weinberger, G. and Menezes, J., Jr. 1983. Water use requirements and physiological response to water stress in pistachio. Annual report of the California Pistachio Commission, Crop Year 1982 - 1983, pgs. 53-57. Goldhamer, D.A., Kjelgren, R., Beede, R., Moore, J.M., Menezes, J., Jr., and Weinberger, G. 1984. Physiological response of pistachio to severe water stress. Annual report of the California Pistachio Commission, Crop Year 1983 - 1984, pgs. 44-47. Goldhamer, D.A., Kjelgren, R., Beede, R., Williams, L., Moore, M.J., Lane, J., Weinberger, G. and J. Menezes, 1985. 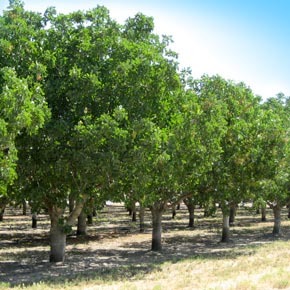 Water use requirements of pistachio trees and response to water stress. Annual report of the California Pistachio Commission, Crop Year 1984 - 1985, pgs. 85-92. Goldhamer, D.A and B. H. Beede. 2004. Regulated deficit irrigation effects on yield, nut quality and water-use efficiency of mature pistachio trees. Journal of Horticultural Science & Biotechnology (2004) 79 (4) 538-545. Goldhamer, D.A. 2005. Irrigation Management chapter of University of California Pistachio Production Manual (2005). Edited by L. Ferguson. pgs. 103-116. Bob Beede, UCCE Farm Advisor, Kings Co.
Blake Sanden, UCCE Irrigation & Agronomy Farm Advisor, Kern Co.